At the 2006 Denver Film Festival, it was my privilege to host an onstage Q&A with Scott Wilson, the exceptionally versatile and talented character actor who passed away Saturday at age 76. And I would like to share my indelible memory of something that happened that evening. As the clips were screened for the audience, Wilson and I stood in the back of the theater, waiting for our cue to walk to an area in front of the screen and face the crowd. We had met earlier that day, and enjoyed each other’s company during a lengthy conversation about his career. (He seemed especially happy, and just a tad surprised, when I told him how much I loved his performance in Krzysztof Zanussi’s A Year of the Quiet Sun, a 1984 drama that has never gotten the attention it deserves, even after Roger Ebert aptly designated it a “Great Movie” in 2003.) And so, as we stood there in the darkness, it felt only natural to rest our arms on each other’s shoulders, as new acquaintances preparing for a joint venture. But when the clip from Monster began, I couldn’t help noticing that his arm started to tremble. At first, I simply assumed that he was experiencing some pre-performance jitters, or a touch of stage fright. (You might be surprised to know how many times I have noticed such nervousness in actors and actresses. Something very similar happened several years earlier when I greeted Warren Oates before a small press reception for Stripes in Dallas; when he spotted me there, just a few hours after I had interviewed him on the location of a movie he was shooting in Big D, he walked over, greeted me warmly, and said, “I’m glad to see somebody I know here.” His arm also was shaking as he placed it on my shoulders.) The longer the scene continued — and if you’ve ever seen Monster, you know how excruciating it is — the trembling accelerated, and his breathing sounded forced. I actually found myself holding Wilson tighter, for fear he might swoon. Of course, he didn’t, and probably I was foolish to think that he would. But, then again, maybe not. Here’s the thing: Up to that moment, I had never really considered what it must feel like to watch yourself on the verge of being killed — and spending your final moments begging for your life. Yes, of course, it’s acting. But if you’re a truly great actor — which I think Scott Wilson most certainly was — and you thoroughly immerse yourself in the character you’re playing, to the point where, however fleetingly, you actually become that character, what is it like afterwards when you see yourself die? Especially when you see that death on a literally larger-than-life screen? I often say that, even though a person may die, he or she remains forever immortal on screen. Scott Wilson had already guaranteed a kind of immortality for himself before the Denver Festival Q&A. (During which, not incidentally, Wilson was funny and gracious and forthcoming, and unabashedly grateful for the lifetime achievement honor.) He went on to attract a new generation of admirers with his portrayal of Herschel Greene in the popular cable series The Walking Dead — when I called him a few years back while he was at a fan convention, he sounded very much like a man who had won the lottery while he described viewer reaction to his character — and he continued to make potent impacts in TV and film roles large and small. (Most recently, he was ferociously convincing as a murderously mean SOB opposite Christian Bale and Wes Studi during a late scene in Hostiles.) He will long be remembered for the many characters he portrayed. 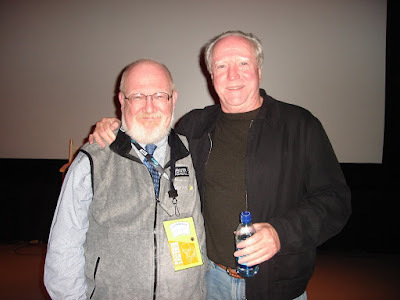 But I admit: I will remember him best for the moment we shared at the Denver Film Festival over a decade ago, and which now I have shared with you. Thank you for sharing your memories of Scott Wilson. He will be greatly missed. Fond memories, Joe. Thanks for sharing.